Embryonic stem cells possess the capacity to divide for long periods and retain their ability to make all cell types within the organism. These are termed pluripotent stem cells. The best known type of pluripotent stem cell is the one present in embryos that helps babies grow within the womb. These cells form at the blastocyst stage of development. A blastocyst is a hollow ball of cells that is smaller than a pinhead. The embryonic stem cells lie within this ball of cells. Embryonic stem cells are derived from embryos. They are specifically obtained from eggs that have been fertilized in vitro for an infertile couple in an in-vitro fertilization clinic. These are excess fertilized eggs that are donated for research with informed consent of the donors. These embryos are not eggs that have been fertilized within a woman’s body. Embryonic stem cells are grown in the laboratory using a procedure called cell culture. The human embryonic stem cells are first isolated by removing the inner cell mass into a plastic laboratory culture dish that contains a nutrient medium or broth called the culture medium. Kept at suitable temperature and humidity the cells divide and spread over the surface of the dish. Typically mouse embryonic skin cells coat the inner lining of the culture dish so they will not divide. This is called the feeder layer. This layer gives a sticky surface to the human embryonic stem cells to attach to. These feeder cells also release nutrients into the culture medium. 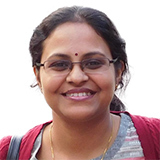 New techniques are devised to avoid these feeder cells for the risk of viruses or other macromolecules that may be transmitted from mouse to humans. Over several days the cells of the inner cell mass proliferate and cover the culture dish. They are then removed gently and transplanted onto several fresh culture dishes. This is repeated for many times and for many months and is termed subculturing. Each cycle of subculturing the cells is referred to as a passage. 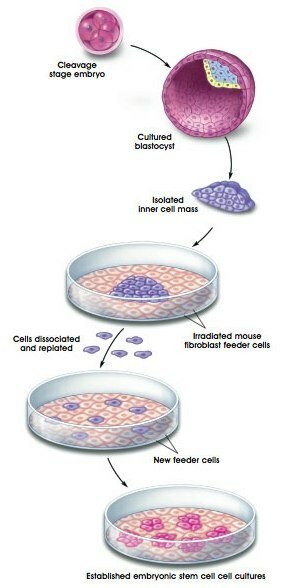 After 6 months of subculturing the original 30 cells of the inner cell mass can yield millions of embryonic stem cells. Since these embryonic stem cells have proliferated in cell culture for six or more months without differentiating they are termed pluripotent cells. They are genetically normal and are now called embryonic stem cell line. Once the line is established batches of the cells are frozen and shipped to other laboratories for further culture and experimentation. The cells are tested at various points during the process of generation to see if they exhibit the fundamental properties that make them embryonic stem cells. This process is called characterization. The cells are subjected to a standard battery of tests that measure the cells' fundamental properties. Subculturing for many months without differentiation is the first test that determines capability of long-term self-renewal. The cells are examined under the microscope to see if they are healthy and remain undifferentiated. Another important test is to look for presence of a protein called Oct-4 that is typically made by undifferentiated cells. Oct-4 is a transcription factor that helps turn genetic switches on or off. Chromosomes of the cells are also examined to look for damage if any. The undifferentiated embryonic stem cells are next stimulated to differentiate into the desired type of cell. For this, the cells are allowed to clump together to form embryoid bodies. This helps them differentiate spontaneously. They make nerve cells, heart cells, brain cells, muscle cells and other types of cells. However, this spontaneous differentiation does not help in the production of desired cultures of specific cell types. To produce differentiated cells the researchers change the chemical composition of the culture medium and the surface of the culture dish and modify the cells by inserting specific genes.